Chief of army staff General Raheel Sharif will retire on 29 November 2016 along with current Chairman Joint Chiefs of Staff Committee General Rashid Mehmood. 1- Lt. Gen. Zubair Mehmood Hayat, an artillery officer, is the senior most and is the present Chief of General Staff of Pak Army. 2- Lt. Gen. Najib Ullah Khan, who is from the Corps of Engineers and is presently serving as Director General Joint Staff. 3- Lt. Gen. Wajid Ul Hassan, He is presently serving as the Chairman of Heavy Industries Taxila. However, he has not commanded any corps as yet too. 4- Lt. Gen. Ishfaq Nadeem, who had been Chief of General Staff and was also Director General Military Operations. Presently, he is commanding Multan Corps. 5- Lt. Gen. Javed Iqbal, who is presently commanding Bahawalpur Corps and was previously president of National Defence University. 6- Lt. Gen. Qamar Javed Bajwa. who was previously Commander of important Rawalpindi Corps and is presently employed as Inspector General Training and Evaluation, at GHQ. Lt. General Zubair Mehmood Hayat will be the, Chairman Joint Chiefs of Staff Committee. 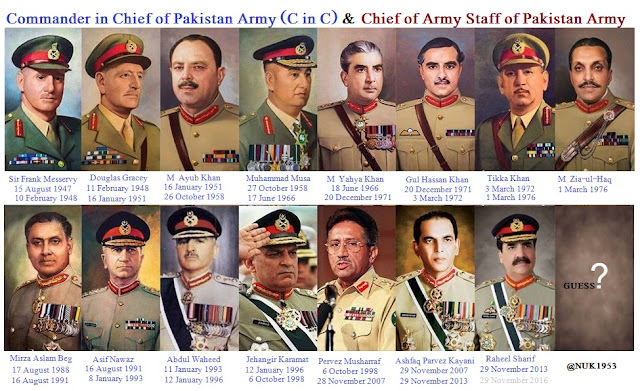 Lt. Gen. Ishfaq Nadeem, will be the, Chief of army staff.